Colorful direction sign of majors. Photo courtesy of Shutterstock. Choosing a major can seem like a daunting task. You are young and you may not know too much about how you want your future to be. You may not know too much about yourself yet, actually. College is a time of growth and discovery. But, you’ll have to pick something, and here are some tips to make your choice with greater confidence. This is an important thing to think about when choosing a major. By figuring out what you are really good at, and not so good at, you will have a clearer idea of what type of jobs and fields of study would best gel with you. It can minimize the risks you will pursue a career for which you are not very well-suited. You may think it would be really glamorous to have a fancy job in finance, but if you don’t work well in a high-pressure environment where the stakes run high, making good money will probably not be enough to override the mental and emotional toll you will experience. What are you good at? What are you not so good at? In your classes you have taken so far, where have you excelled? Where have you struggled? Consider taking an aptitude test to get a better sense here—your school’s career services center likely has a myriad from which to choose. 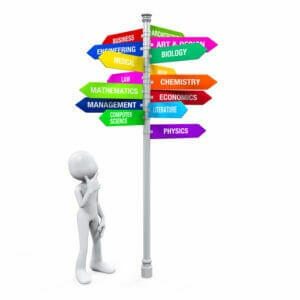 Make sure you deeply explore the variety of career paths available to you under different majors. Each probably has a core set of jobs that comes to mind, and it is easy to dismiss a field because these careers don’t strike any interest. There are so many different types of jobs out there. For example, you may think the only people who would pursue a criminal justice school program are people who want to be cops or work in a prison, but this area of study can prepare you for lots of other type of work, such as a forensic science technician, a fish and game warden, computer forensic specialists or fraud investigation. Interestingly, people who choose this major end up in many fields unrelated to law, such as mental health counselors, healthcare social workers, social and human services assistant, and social work job dealing with children, families and schools. A communications major is not just for people who want to be journalists or work in public relations-it can prepare you for a career in a variety of fields, such as fundraising, marketing or the admissions office in a college. As you can see, a given major opens the door for many more paths than would initially meet the eye, so by digging a bit deeper, you can get a clearer sense of what major might be a good fit for you. There can be a lot of pressure on you now because there is this sense that the major you choose will set the course for the rest of your life, but this isn’t necessarily true. Sure, there are those people who have known what they wanted to do with their life since they were in middle school, but most of us aren’t like that. Lots of people change careers multiple times in their life, and if your choice of major leads you into a certain career right out of college, this doesn’t mean you have chosen your path for life and you must stay on this track. Many people change careers several times throughout their decades of working—you have a lot of years ahead of you, and lots of wiggle room. Another thing to keep in mind is many companies are looking for people with a college degree period—it doesn’t matter what their major was. So, besides the engineering majors and others who are being prepared for a very specific line of work, and know for sure they are entering that field, the remainder can rest easy knowing a whole variety of jobs will likely be open to us no matter what we majored in. When you think about it, the average major doesn’t really prepare you too much for any one line of work—it typically only makes up about a quarter of your required credits. If you consider these three tips, you are well on your way to figuring out this important task.